Star singer, Sheebah Karungi, was the lead artist at the weekly comedy show that was held at the 400 Bar Restaurant in Bukoto. The TNS singer performed most of her hit songs ranging from Sitani Tonkema, The Way and John Rambo which saw her do lap dances with most male guests. After her performance, the singer who was in black pants and a bra top was presented with an award of most downloaded music, she dedicated it to her Sheebaholics and record label, Team No Sleep. 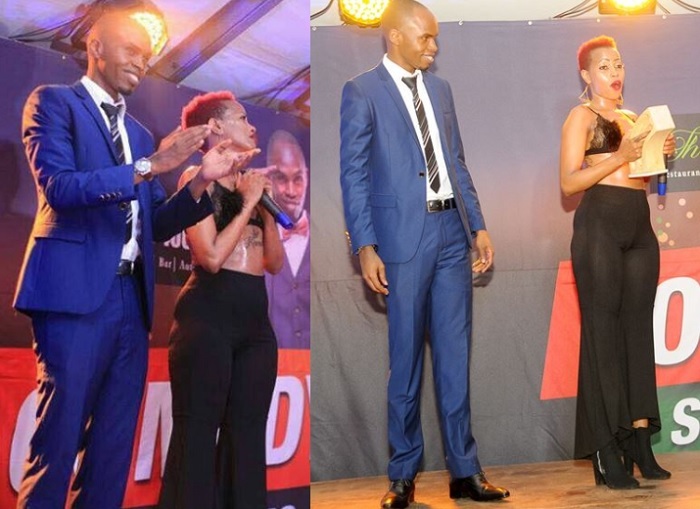 The show host, Alex Muhangi, was equally happy for and while at it, he innocently held her by the waist something that led to serious issues on his lower member. Most guests kept glued to the comedian's pants that were visibly increasing in size as he tightened the grip on the top female singer. Tomorrow (Nov 2), Irene Ntale will be performing live doing her latest, Stamina Daddy and of course other hits.